As we have since July 2006, each Friday we’ll post our sampling of cigar news and other items of interest from the week. Below is our latest, which is the 527th in the series. 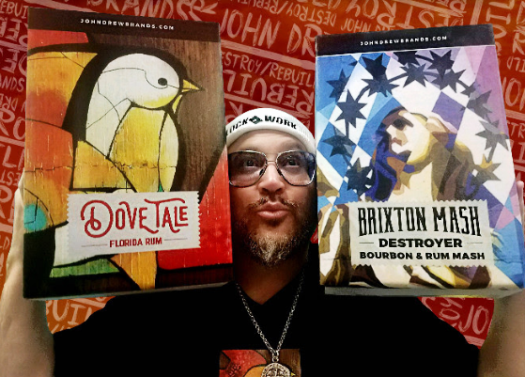 1) On Wednesday, Florida-based retailer Corona Cigar Co. hosted a launch party for John Drew Brands and the spirits venture’s three inaugural products: Brixton Mash Destroyer (55% bourbon, 45% rum), Dove Tale Rum, and John Drew Rye. The event included DJ Maseo from De La Soul and rare Drew Estate cigars. “The movement that began on the production floor in Estelí, Nicaragua that changed premium cigars forever. From a broken down little green house with five employees to the second largest premium cigar maker in the world. Jonathan Drew Announces: John Drew Brands, a consumable start-up, bent on product development, mixed media, culture collaboration, and a reckless spirit to destroy,” reads the John Drew Brands website. Jonathan Drew announced his foray into the spirits industry in April 2016. Swisher International, Inc.—the largest cigar company in the world by volume—acquired Drew Estate in 2014. Two years later, Drew was named president and founder of Drew Estate and once again returned to occupy an executive operating role at the company he founded, including responsibility for the entire portfolio of brands. 4) Inside the Industry: La Flor Dominicana has announced the creation of its own tobacco farm and cigar factory tour in Santiago, Dominican Republic. The five-day itinerary includes a welcome dinner, premium hotel accommodations, factory tour, blending session, pig roast, farm excursion, and opportunities to take advantage of beach, golf, and spa amenities. Cigars will be included, not sold; airfare is not included. Trip availability and prices can be obtained by contacting ligero@lfdcigars.com. 5) From the Archives: Warm days were made for rum, whether you prefer light, dark, golden, or spiced. Here are five delicious concoctions you’ll want to try. 6) Deal of the Week: We recommend Bespoke Post, a monthly collection of awesome items delivered to your door for just $45. Available boxes include a mint julep set, fine bar accessories, shaving kits, wine, workout gear, coffee kits, and more. You can skip or purchase every month. Sign up today and you’ll be able to get the May shipment.